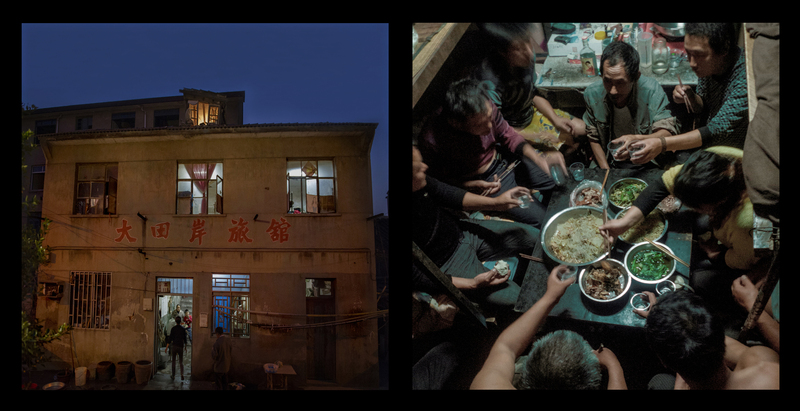 Located in the city of Wuxi, in Jiangsu province, the Big Paddy’s Edge Inn served as a roost for low-income laborers beginning in 1981 when it first opened for business. Residents said that though their means were meager, they got along amiably, and most of the tenants were old friends. On holidays they would gather together to drink and celebrate over potluck meals, and sometimes the hotel manager and owner, Ms. Gu, would treat everyone to dinner. Gu Qimei said she was not in the hotel business for the money. Instead, her frugal management just barely kept the inn afloat and its bills paid. When she took over as manager in 2000 the nightly rate was 5 RMB. She only ever raised that rate once, in 2010, when she raised it 1 RMB, or 16 cents. She provides cooking implements, utensils, and fuel free of charge for the tenants to use. Huang Shuizhen, 75, was from the city of Huzhou, Zhejiang province. She lived at the Paddy’s Edge for 15 years. 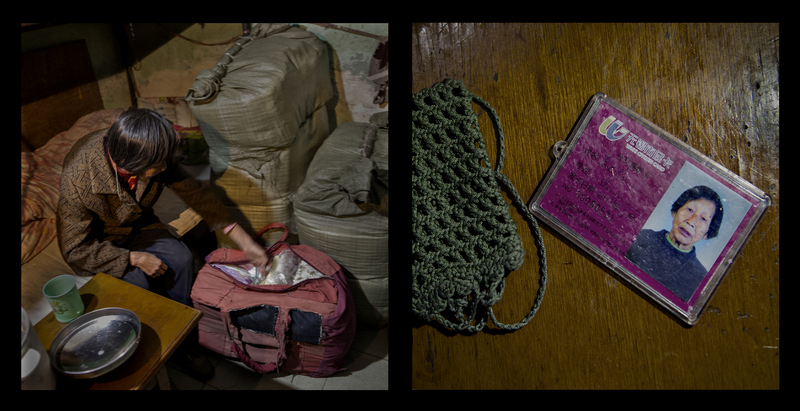 For many years she peddled bed linens, blankets, and other items on the streets of Wuxi, but she said the police would often try to drive her away. 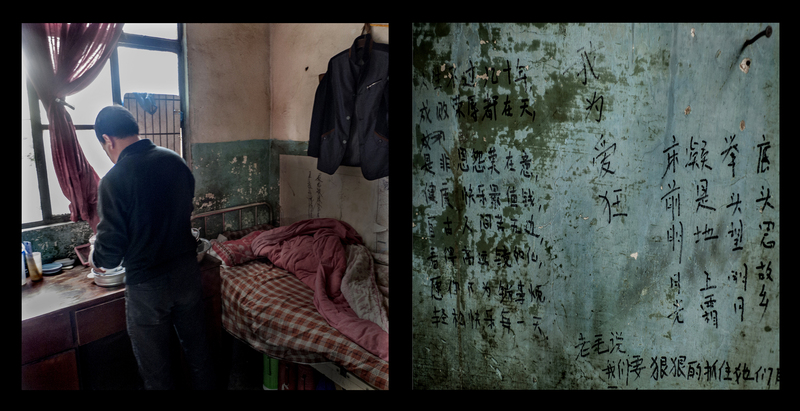 Shen Gengqing, 62, a Wuxi native, moved to the Paddy’s Edge eight years ago during a time of hardship: his wife had committed suicide by drowning herself in a river, and his daughter went through a divorce and then lost her job. 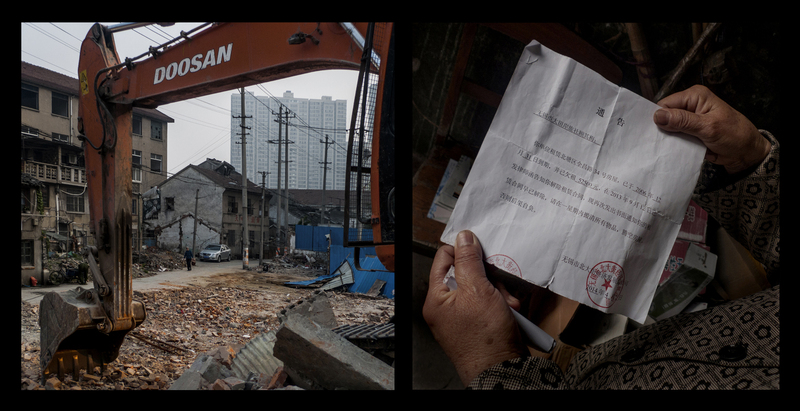 Shen said his home was demolished in 2006, and the new apartment he was promised never materialized. After successfully lodging a complaint with the district government, he received a subsidy for landless farmers of 500 RMB a month on top of his 100 RMB a month pension. 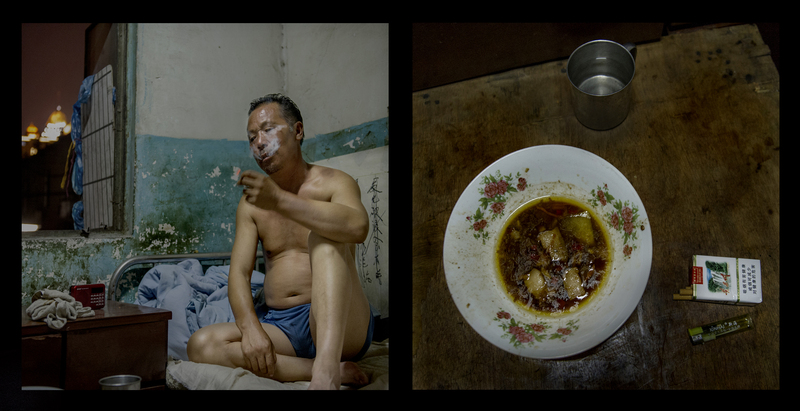 He said he spent more than 200 RMB a month to treat his medical conditions, including diabetes and prostatitis. 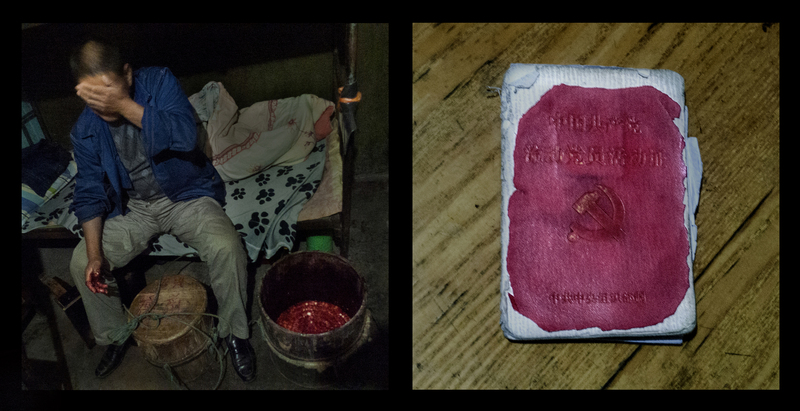 Li Jie, 28, from Anhui province, made his living selling rat poison. He lived at the Paddy’s Edge for four years and was taking driver’s education classes in preparation for applying for a license. Once, Li said, security guards at a nearby market apprehended him and threatened to take him to the police station. When Ms. Gu went to bail him out, the guards set him free, but she had to pay 1,200 RMB in bail. Li Tongbiao, 45, also from Anhui, was Li Jie’s uncle. Disabled since childhood, he begged for a living and moved to the Paddy’s Edge in February 2010. The son of a village Communist Party Secretary, he had polio when he was four years old, which deformed his hands and left him handicapped. 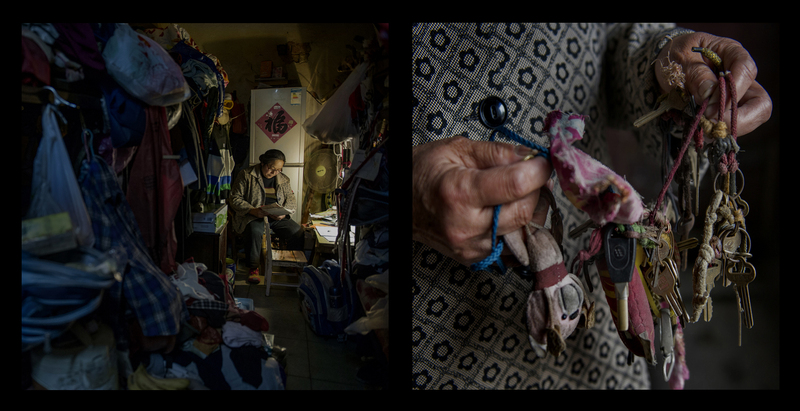 Shen Yuejuan, 52, originally from Zhejiang province, sold blankets and bed linens for a living. She has lived in Wuxi for more than 18 years. Once a well-off woman, she ran a business in northeast China for 15 years, making as much as 20,000 RMB a year, a sizable income at the time. In 1987 she says she was swindled out of 70,000 RMB worth of merchandise, and afterwards fell heavily into debt. Luo Jianbin, 49, came from Henan province. He sold balloons, writing implements, and toys and lived at the Paddy’s Edge for eight years. When he was young he missed the cutoff to get into university by just two points on the entrance exam. He had excellent handwriting, and said that many Party members in his village came to him for help filling out forms. He was arrested in his hometown for making counterfeit liquor, and came to Wuxi to do business in 2006. 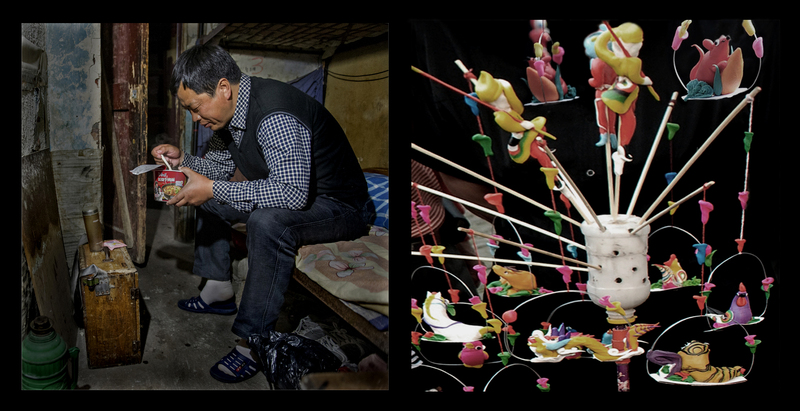 In the summer of 2013 he brought his son, who was a university student at the time, to Wuxi to sell balloons to teach him how hard it is to make money. On his first day, his son made 25 RMB. Sun Daozhong, 59, came from the city of Huangshan in Anhui province. He made his living selling ‘doufuru,’ a type of fermented bean curd (pictured), and lived for more than half the year at the Paddy’s Edge. He joined the army in 1976, where he earned the rank of sergeant, served in the 1979 Sino-Vietnamese War, and was awarded a Class Three Merit Citation. After retiring from the military he spent six years as Communist Party Secretary for a production brigade. As a member of the Party, he carried a “Mobile Party Member Activity Permit” printed by the Central Committee. Du Jianfu, 54, from Henan province, was a nursing assistant and worked at various hospitals. He lived at the Paddy’s Edge for more than eight years. Du suffered from a curved spine that gave him a hunchback, and had never married. 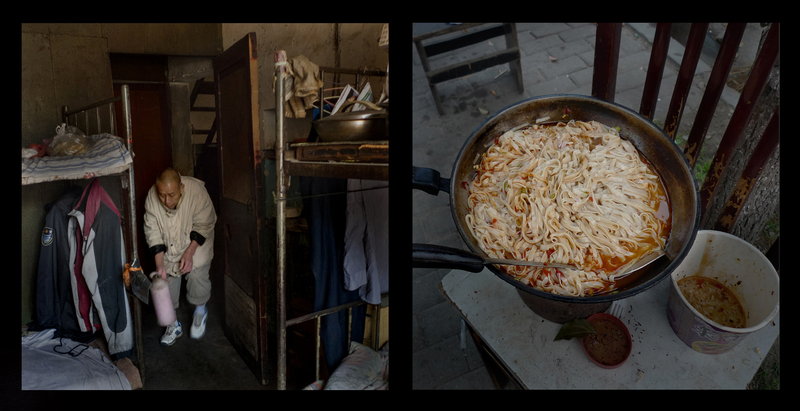 His business card read, “Manager, Wanshixing Nursing Services, Wuxi, a nurse aide for 22 years, who has cared for over 2,600 patients.” He had a hearty appetite and could polish off a big bowl of noodles in one sitting. 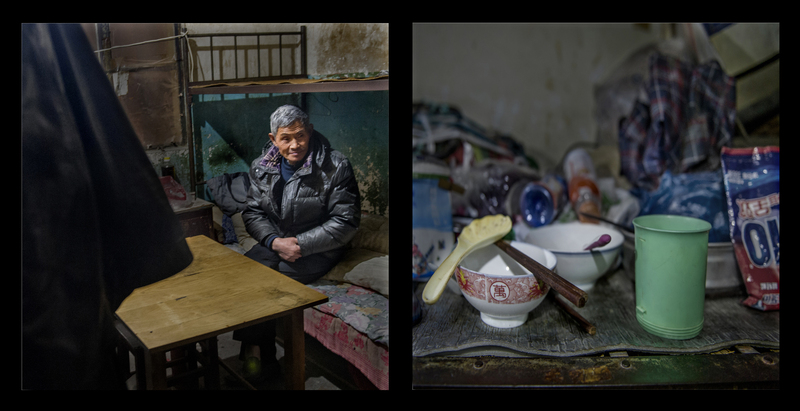 Sheng Qinghong, 59, from Jiangxi province, peddled toys, and, in the autumn, he sold roasted sweet potatoes and corn. He lived at Paddy’s Edge for seven years. He liked cooking with fatty meat, saying that he found oily dishes the most satisfying. He drank baijiu every evening, and for 7 RMB apiece bought the liquor in 1-liter plastic bottles, which often lasted him only three nights. 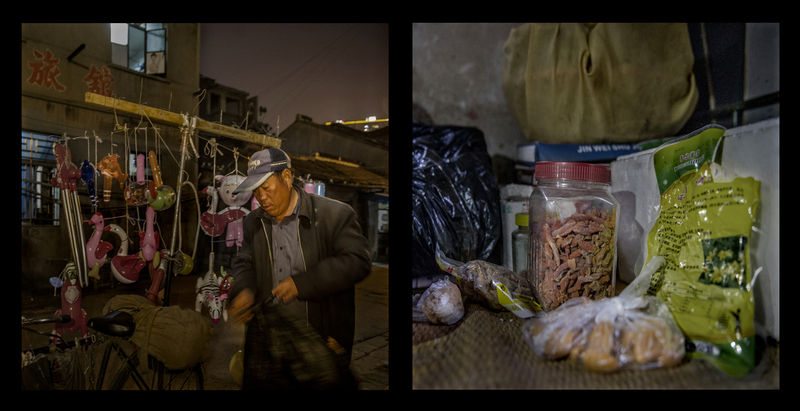 He smoked the cheapest possible cigarettes, Yellow Fruit Trees, which sold for 2 RMB a pack. He smoked three packs a day. Yang Minhua, 43, from Jiangsu province, was the youngest of seven brothers. He joined the army in 1993 and served for three years in a firefighting unit in Baoji, Shaanxi, during which time he held the posts of sergeant, quartermaster, and county fire chief. After leaving the army he became a migrant laborer, working as a construction worker and security guard. He drank liquor at every meal and was often drunk. Qiu Weiming, 48, was a dough sculptor from Jiangsu province. He lived at the Paddy’s Edge for 22 years, and was the inn’s longest-running tenant. 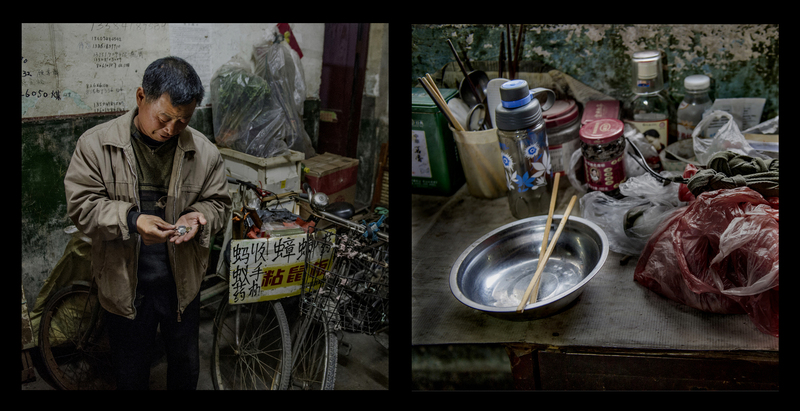 For most of the year he sold dough figurines in Wuxi, and returned to his hometown during the peak agricultural season. With his wooden box on his back, he stood at park entrances or busy street corners, molding colorful figurines for children. Because materials were cheap and he did all the work by hand, he made a decent profit and, after many years of work, he built himself a new house in his hometown. Wang Qifa, 68, was originally from Jiangsu province. His wife was long deceased, and he had raised his son alone. After graduating from the Changzhou Institute of Technology, his son had worked in Wuxi at a factory and at the Chong’an District government. For many years his son had not returned home, and by 2008 the two had completely lost contact. Wang Qifa shuttled back and forth between Gaoyou and Wuxi every year, looking for him. Each time he stayed for several weeks at the Paddy’s Edge. Fan Xingbing, 50, was originally from Jiangsu province. He had once lived with his wife’s family, but he had a nasty temper, he said, and his father-in-law, the Communist Party Secretary of a production brigade, demanded his daughter divorce Fan. Fan left for Wuxi. He lived at the Paddy’s Edge for over a decade. He used to repair bicycles on the sidewalk in Wuxi, but he got into a fight with another repairman and was beaten severely. Now he is responsible for cleaning and polishing marble surfaces at a Wuxi hotel. 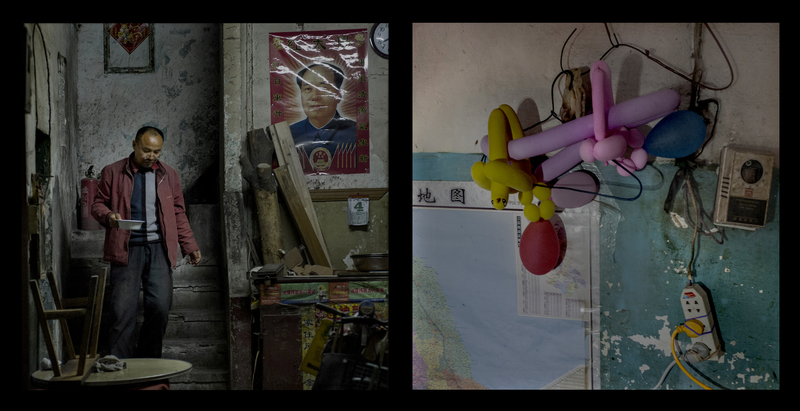 Wang Honglin, 53, from Henan province, sold balloons and other toys in Wuxi for almost two decades. He lived at the inn for six years. He said he worked hard because he wanted his son to go to college. Eventually, his son became a fashion designer in Shanghai and was the pride of the family. In early 2013, Wang’s son got married, but the marriage ended just a year later. Wang couldn’t fathom why young people act the way they do, and he found it very depressing. On April 2, 2014, the demolition notice arrived. A police officer delivered the notice that the hotel must cease operation. The residents were left with no choice but to pack their bags and scatter to the four winds. A week later, while Ms. Gu was away, demolition workers began to dismantle the Big Paddy’s Edge Inn. It had been in operation for 33 years. A version of this gallery first appeared on the Chinese website Tencent QQ. The text was translated by Austin Woerner and edited for clarity. Beginning in 1981 when it opened its doors in the Chinese city of Wuxi in Jiangsu province, the Big Paddy’s Edge Inn attracted some of the city’s most colorful characters. The inn’s proprietor, Gu Qimei, charged a rock-bottom nightly fee of 6 RMB—or less than U.S.$1—to her residents, who shared daily necessities like food and cooking fuel. 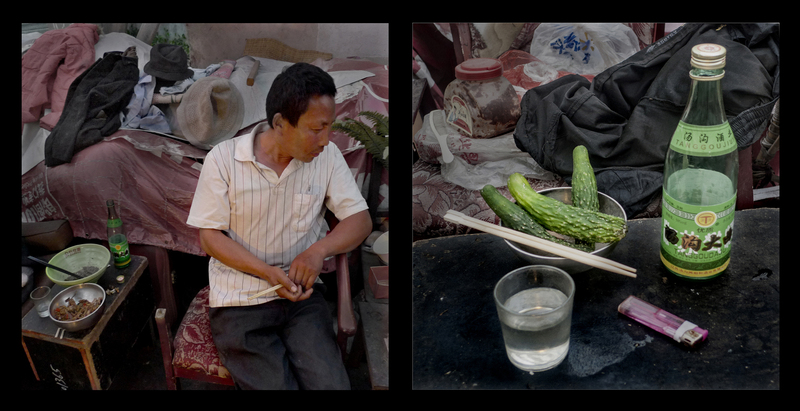 In 2009, Jiang Rongfa began photographing the hotel and interviewing many of its residents. Last year, after 33 years of operation, the hotel was forced to close when Wuxi demolished it to clear the way for new development. The city of Wuxi is located on the shores of Lake Tai in Jiangsu province, in a region long known as the breadbasket of China. Today the city has a booming economy, with a per capita GDP of 124,000 RMB in 2013. Quanchang Road, in the Beitang district, was once a flourishing commercial thoroughfare. For more than three decades, it was also home to the Big Paddy’s Edge Inn, a hotel that charged its guests the low fee of only 95 cents a night. Thanks to its bargain prices, the Paddy’s Edge drew an eclectic crowd. 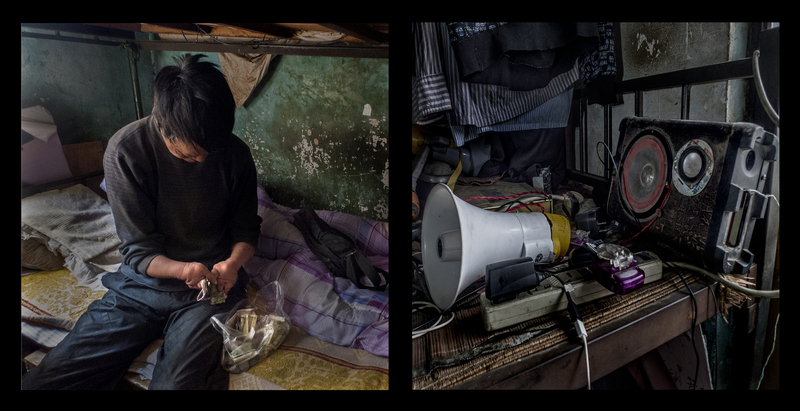 Its residents, some of whom stayed for more than 20 years, included peddlers of combs, belts, blankets, flower seedlings, balloons, fermented bean curd, rattles, roast sweet potatoes, and rat poison; a buyer of used cell phones; a tricycle deliveryman; a man who repaired bikes; disabled people who sang or begged for a living; a nurse’s aid and a hotel handyman; a few con men; and street performers who made sculptures out of dough and blew figurines from spun sugar. Not only was the price impossible to beat, but in the convivial atmosphere many guests came to see the Paddy’s Edge as home. On holidays, they held potluck dinners or the proprietress Ms. Gu treated the entire hotel to a free meal. The tenants seldom argued or fought. Facilities were crude. Eight rooms contained a total of 38 beds, and four of the rooms slept six apiece on steel-framed bunk beds. There were also several doubles. The interior was spartan, with hard wooden beds, old-fashioned square tables, a communal bathroom, and a single black-and-white television in one room. In order to cut costs, all the lights used energy-saving bulbs, and during the summer the tenants used only electric fans for fear of burning out the hotel’s ancient wiring. In the courtyard there was a well, and near the door stood a collection of jars and basins in which the residents washed their clothing. To keep the water bill down, tap water was used only for cooking. The management provided free cooking implements and fuel for communal use; in the alleyway behind the hotel sat four coal stoves, fed with cheap coal briquettes, on which the tenants prepared meals and boiled water. 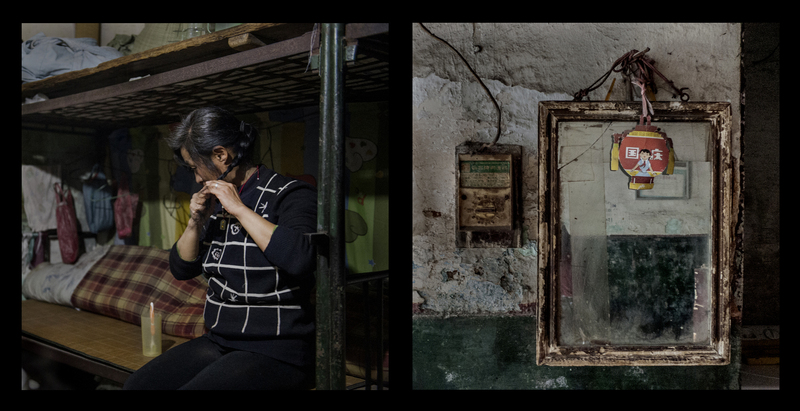 Before the Communists came to power in 1949, the land the Paddy’s Edge occupied was home to a row of one-story buildings where a coffin maker sold cheap wooden caskets. 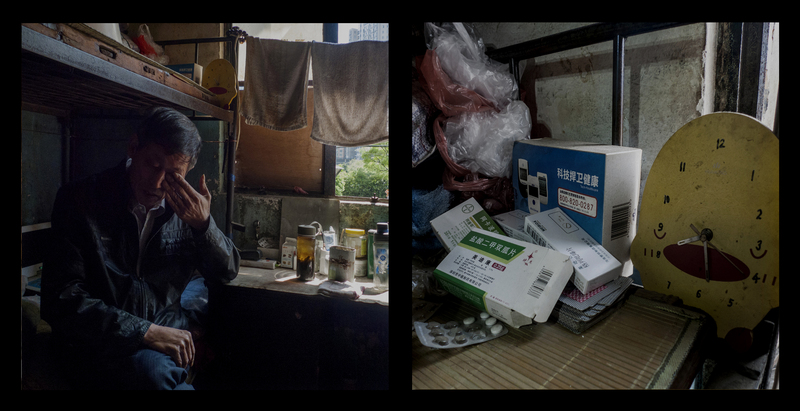 In 1966, at the beginning of the Cultural Revolution, the coffin maker fled to Hong Kong and ownership of the building was transferred to the Big Paddy’s Edge Neighborhood Committee of Wuqiao Street. 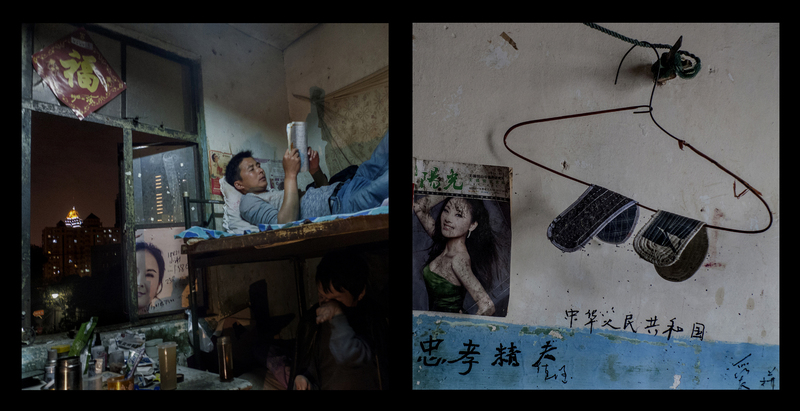 In 1981, the district housing authority and Wuqiao neighborhood committee jointly put up funds to renovate the property, replacing it with a small two-story, three-room-wide building that the neighborhood committee then began operating as an inn. At the time, the nightly rate was just 8 mao, less than 1 Yuan or 47 cents (adjusted to a 1981 exchange rate). The new hotel did brisk business and was often at capacity. Sometimes the management even had to add extra beds. The hotel owner, Gu Qimei, used to work at a nearby hostel. In 2000, when she retired at the age of 50, she bought the Paddy’s Edge and began to manage it. When she bought it the nightly rate was 5 RMB. The hotel was already providing guests with stoves and cooking implements free of charge so that they could prepare their own meals. In 2010, after consulting with the long-term residents, Ms. Gu raised the nightly rate to 6 RMB. Eventually the district where Paddy’s Edge was located was marked for demolition. In April 2014, a police officer delivered the notice that the hotel must cease operating because it was going to be demolished to make way for new development and construction. The tenants were forced to pack their bags and vacate. A week later, while Ms. Gu was in the hospital receiving treatment for the flu, several dozen demolition workers and police officers arrived and began to tear the inn down.